Among the books (actually a 16 foot printed scroll) was Gautama Buddha's Diamond Sutra ("The Sutra of the Perfection of Wisdom of the Diamond that Cuts Through Illusion") the earliest known dated book in the world and of inestimable value. The BM site explains '...It’s dated in a colophon – a note printed at the end of the scroll. The note reads “Reverently made for universal distribution by Wang Jie on behalf of his two parents” followed by the Chinese calendar date for 11 May 868. Wang Jie did not make the book himself, but enabled its making – a pious act by which he would have gained much merit...The printed scroll was one of 40,000 other books and manuscripts. This secret library was sealed up around 1,000 AD, a time when this desert outpost of China was threatened by the ambitions of the Hsi-Hsia kingdom to the north. The cave is part of a holy site known as the ‘Caves of a Thousand Buddhas’ – a cliff wall honeycombed with 492 grottoes cut from the rock from the 4th century onwards and decorated with religious carvings and paintings. A monk discovered the sealed entrance to the hidden cave in 1900. 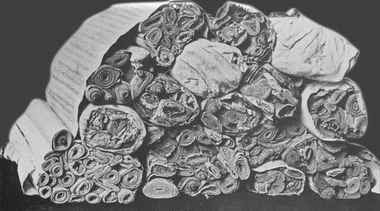 Inside, the scrolls of paper and silk had been perfectly preserved by the dry desert air." Aurel Stein (seen above with native guide and dog) produced many works himself that are valuable--the net reveals items at as much as £14K. Many have poetic, evocative titles such as 'Ruins of Desert Cathay' 'Sand-Buried Ruins of Khotan' 'On Ancient Central-Asian Tracks.' This last title from 1933 can turn up in a jacket and make as much as £3K if sharp. On his first great Central Asian expedition Stein followed in the footsteps of Sven Hedin, who in 1893 had found unexplored ruins at the oasis of Khotan, along the southern edge of the great Taklamakan desert in Chinese Turkestan. 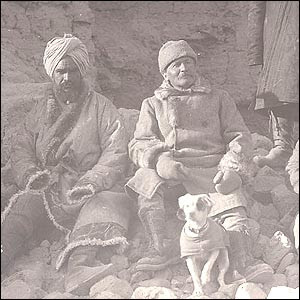 Hedin was unable to undertake any systematic examination of the site, but Stein convinced the Indian Government under Lord Curzon to supply and fund his archaeological and geographical expedition in 1900-01. Stein's excavations became the first scientific survey of the spread of Buddhism out of India and into greater Asia. It was thus fitting he should bear the Diamond Sutra back to the West. Quite how he did this I am unsure, one imagines a combination of horse and cart, train and steam ship. Even rolled up and compressed 40,000 items would have presented a serious problem in logistics. Something of the excitement of this find is conveyed in Peter Hopkirk's 'Foreign Devils on the Silk Road' and in this lecture by Ray Greenblatt in 2000. As with many of these deals you would probably find that £130 is all Stein had on him at the time. A second buy of this treasure was made in 1908 by the French archaeologist Paul Pelliot. Unlike Stein, Pelliot was fluent in Chinese; so he was able to be more selective in the manuscripts he chose for purchase. The moral of this from a dealer's point of view is not to assume that the first person on the scene gets every single treasure. Until someone finds a cache of Shakespeare manuscripts in darkest Warwickshire these finds are unlikely to be topped. It was a robbery or trick.